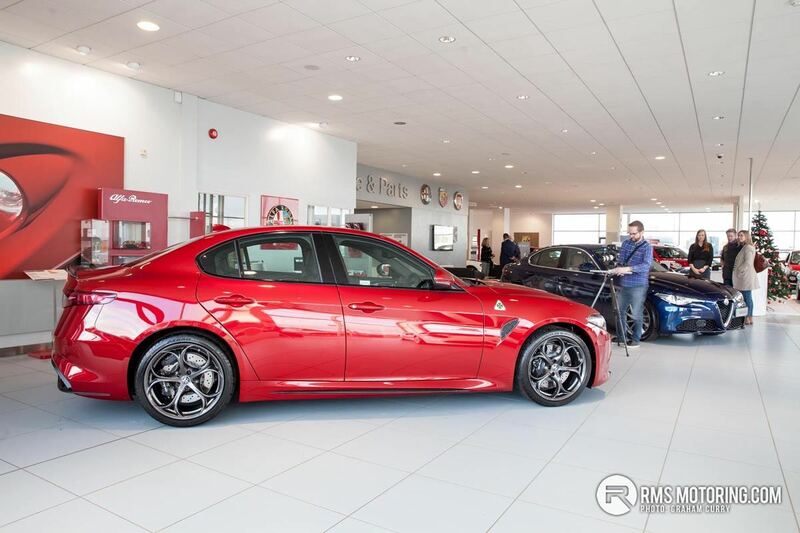 You are at:Home»News»Alfa Romeo Giulia Quadrifoglio – a proper RS and M rival? 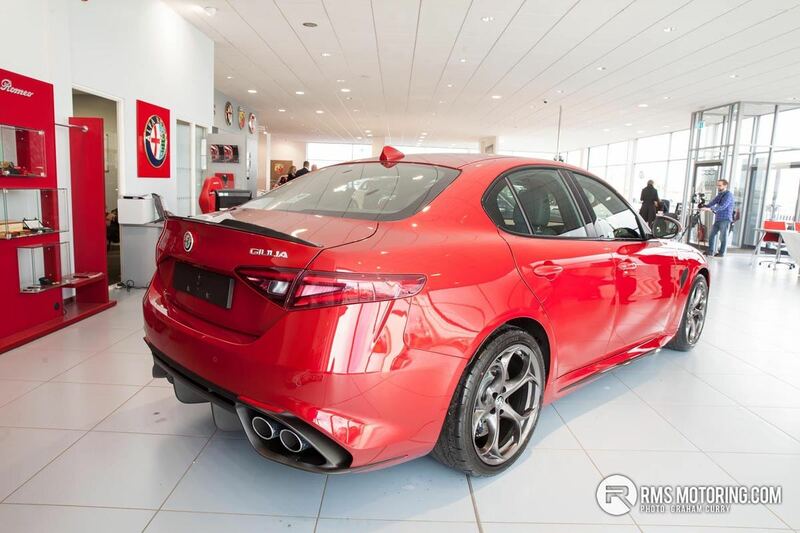 It may sound like a cross between a Shakespearean play and a gourmet pizza, nevertheless the Alfa Romeo Giulia Quadrifoglio promises to blow the highly competitive sports saloon segment to pieces. 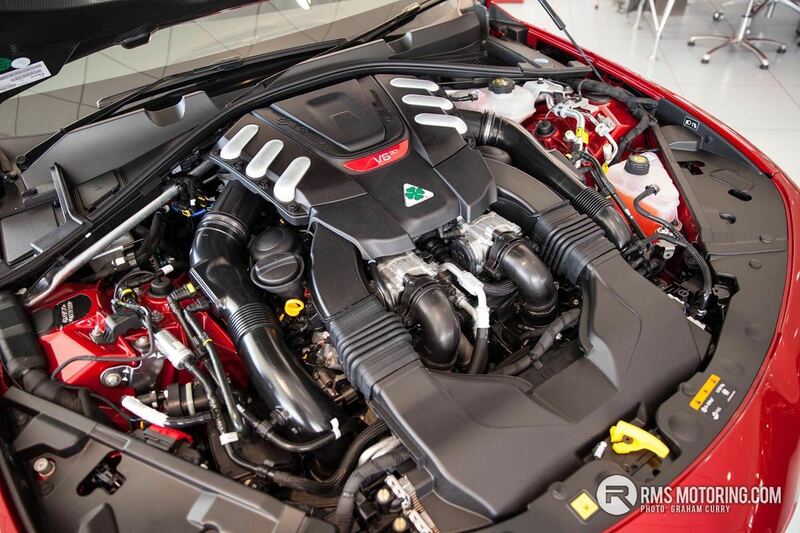 Classic Italian styling hides a thumping 510 bhp bi-turbo V6 engine which produces a whopping 600Nm of torque. 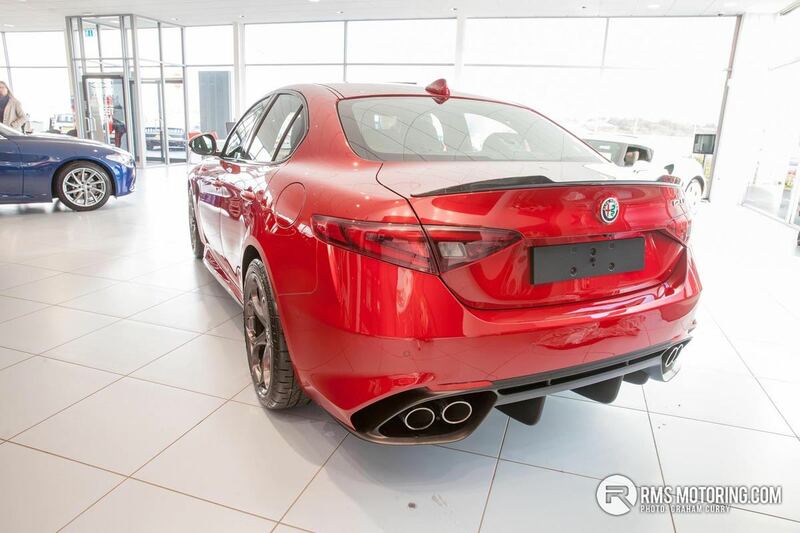 Alfa reckon the car can sprint to 1oo km/h (62 mph in our money) in just 3.9 seconds. That’s phenomenal performance. 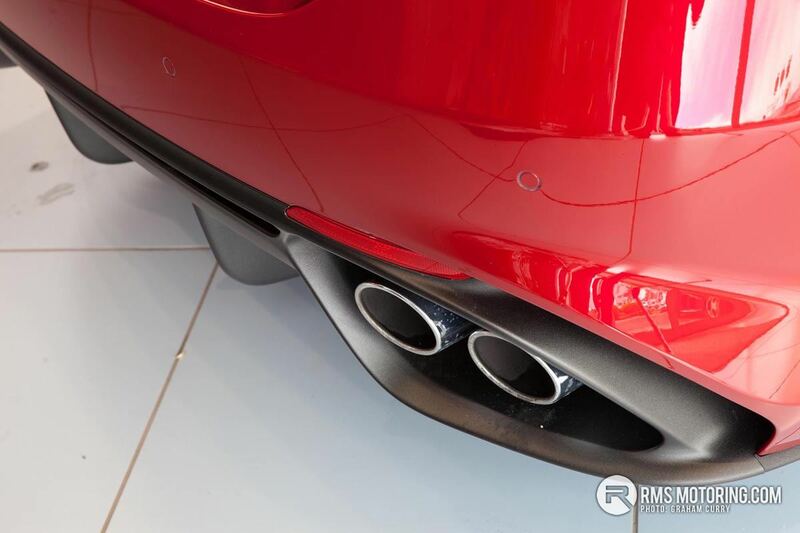 The engine note, as you would expect from a powerplant that shares DNA with the Ferrari California, is suitably throaty. 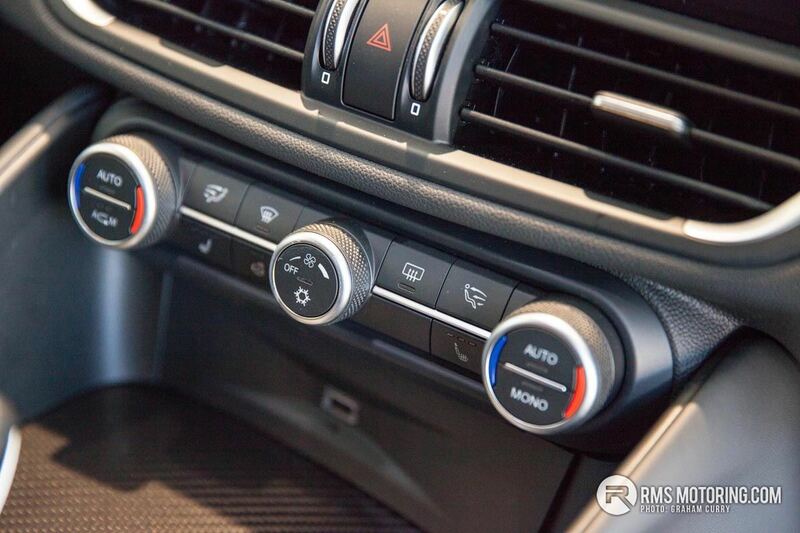 It really just wants you to rev it so you can hear those screaming top notes. 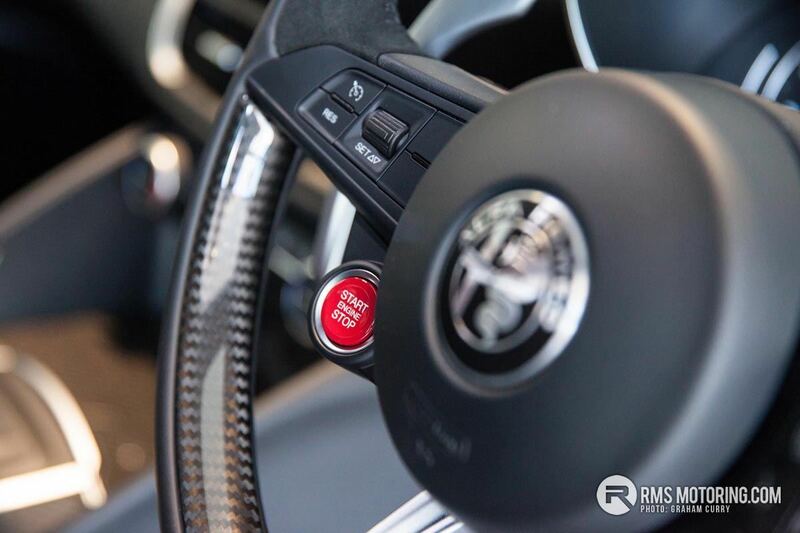 The UK spec cars all come with an 8 speed auto, which pushes all that grunt to a very clever rear diff, which then decides how much torque will go to each wheel. 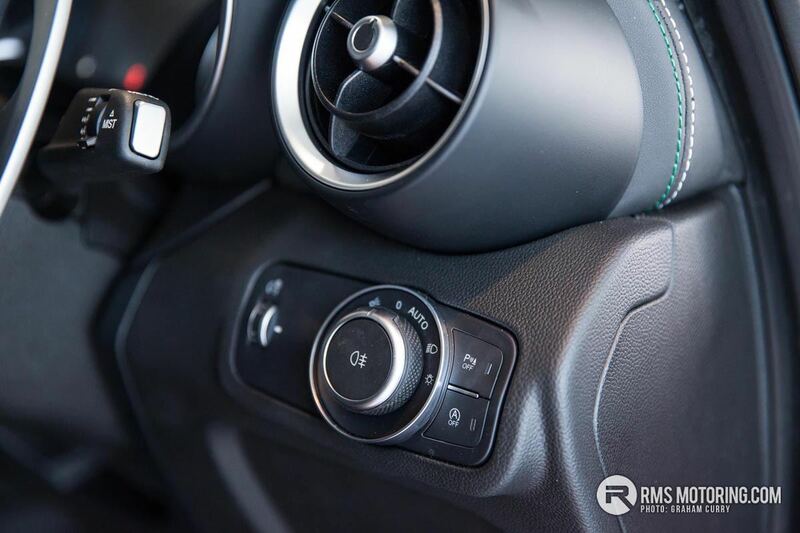 The purpose is to avoid wheel spin and deliver power in a much more progressive way that existing traction control systems. 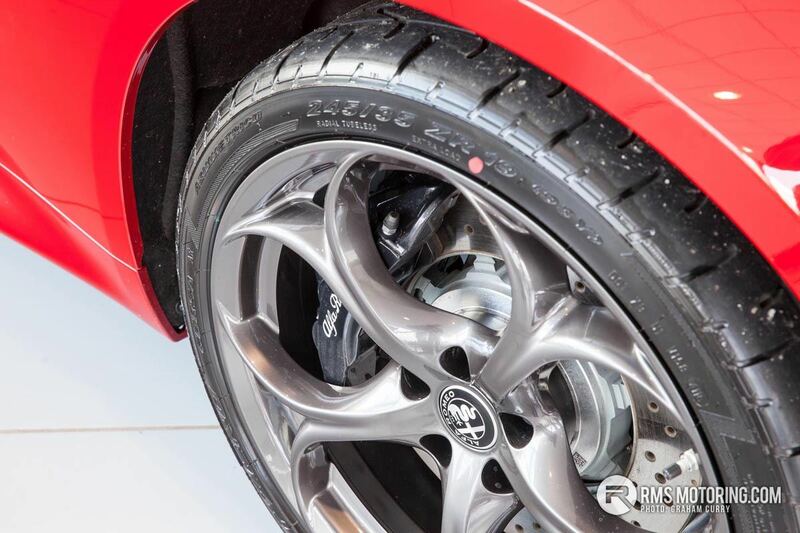 The QV gets Alfa’s latest incarnation of the signature teledial wheels and an active aero package comes as standard. 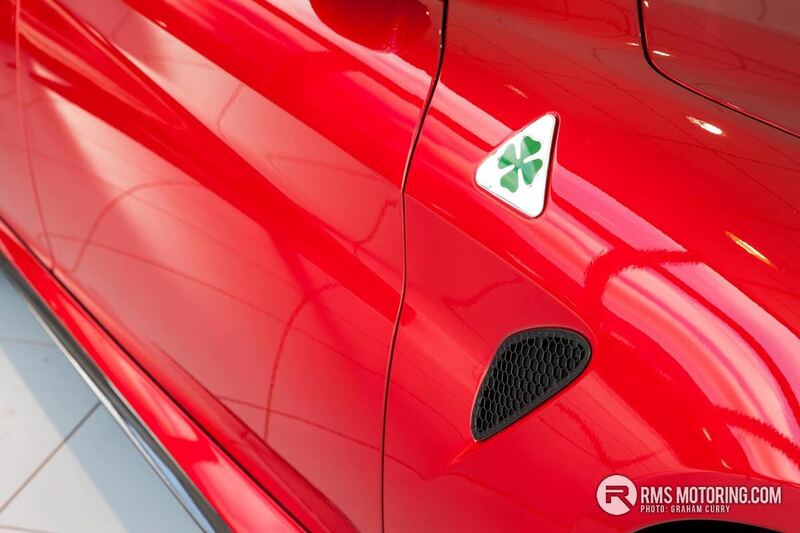 Alfa promise that the car will handle beautifully too. 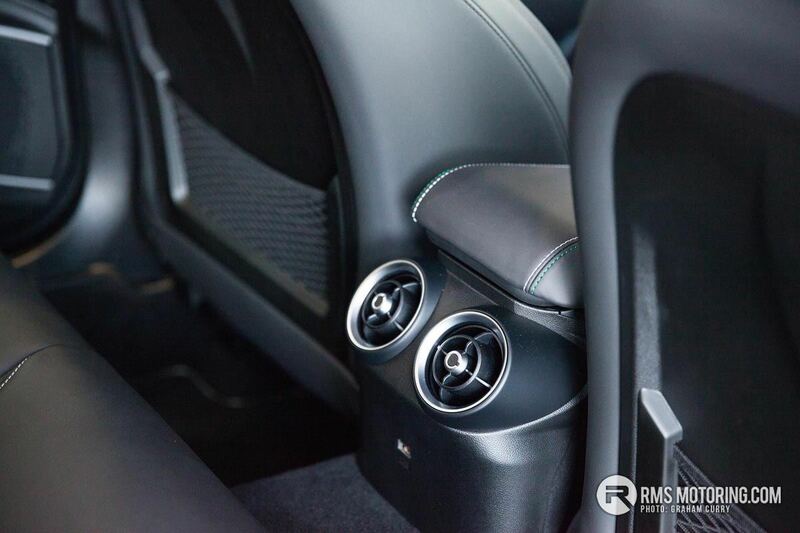 The suspension is classic double wishbones up front with an innovative four-arm link set up at the rear. 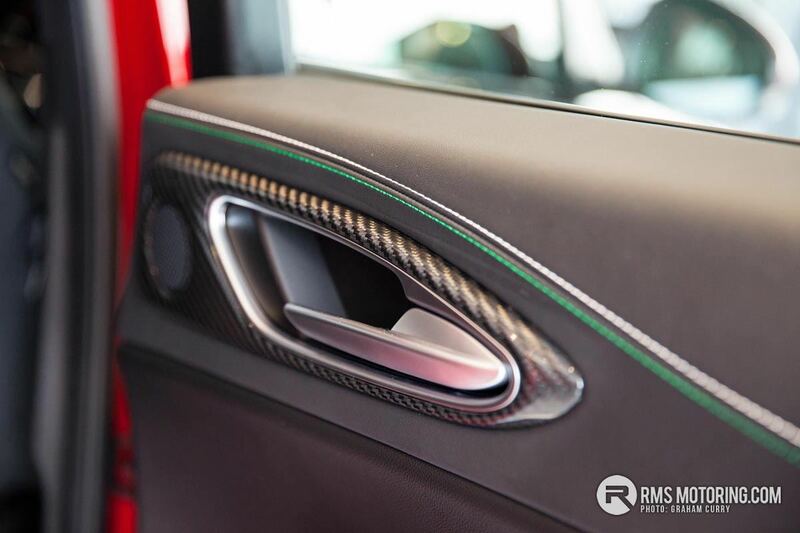 The car has near perfect 50/50 weight distribution, helped by extensive use of lightweight panels and swathes of carbon fibre. 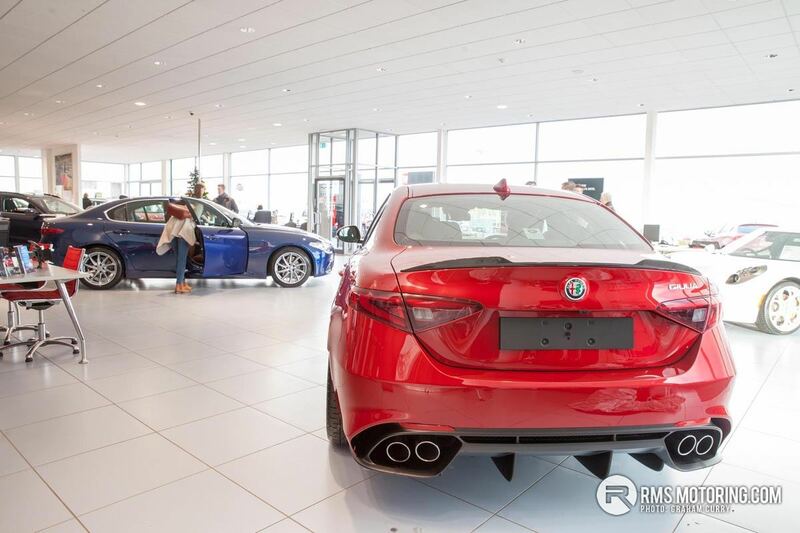 The new Giulia utilises aluminium composite and plastic for the rear cross-member and aluminium for the doors, wings, engines, brakes and suspension – including the front suspension domes and front and rear subframes. 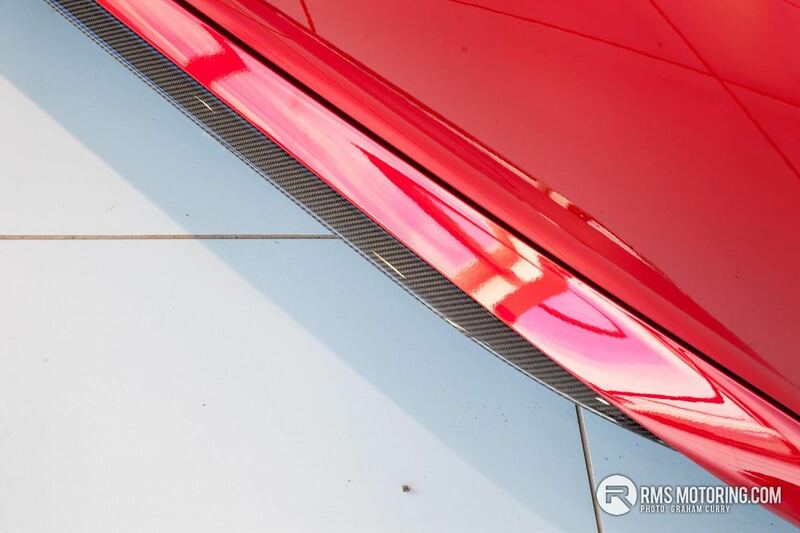 The front splitter, body inserts and rear spoiler are made from carbon, as is the bonnet, roof and even the driveshaft. 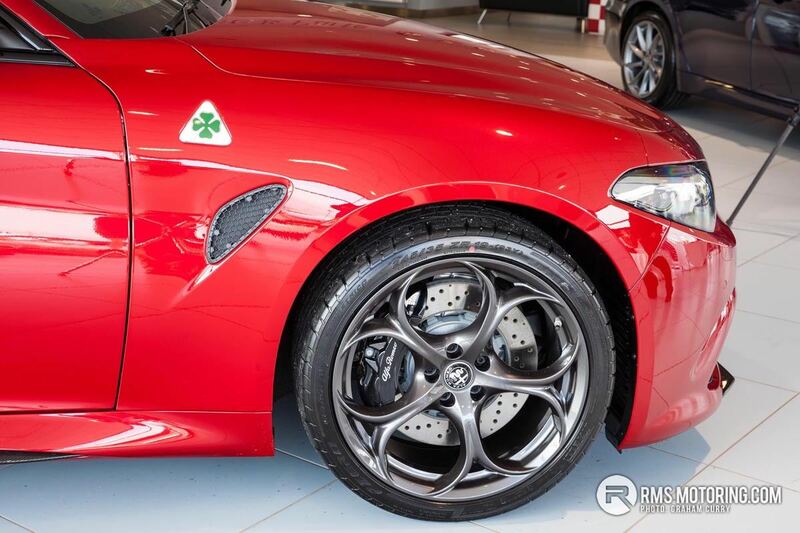 Net result is a curb weight which Alfa claims is 40kg lighter than a BMW M3. 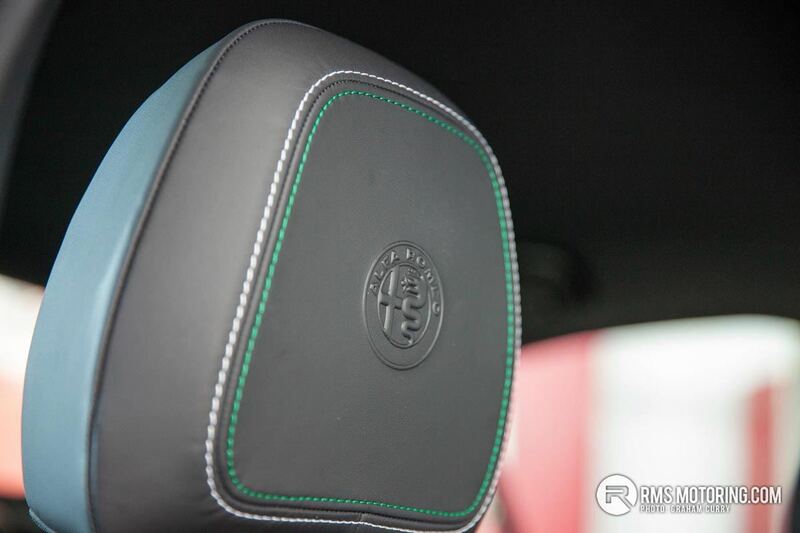 The interior is classic Alfa. 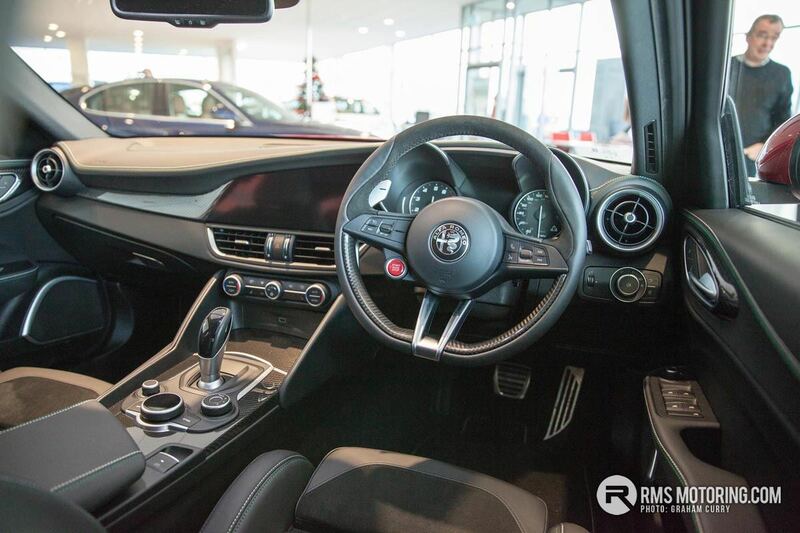 Big round dials dominate the dashboard, split by a 7 inch TFT screen. 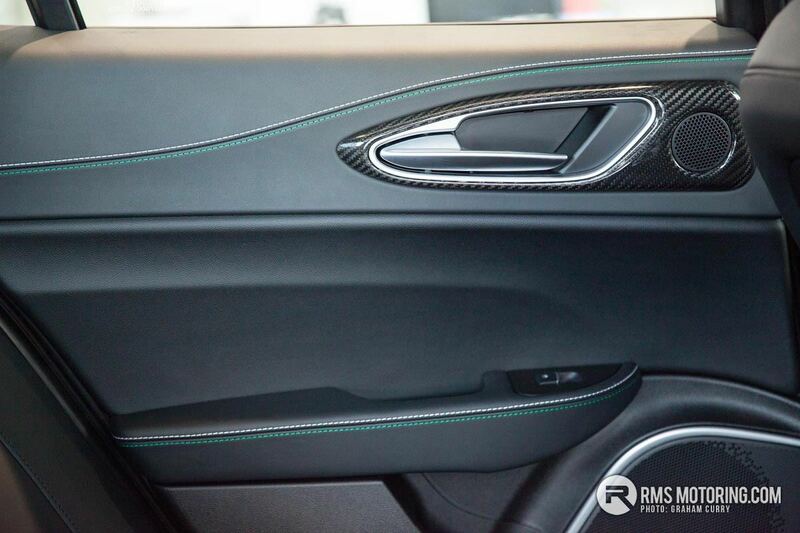 Beautiful Alcantara seats and leather seats, lavish stitching, splashes of carbon fibre and the odd slightly suspect looking bits of plastic trim. 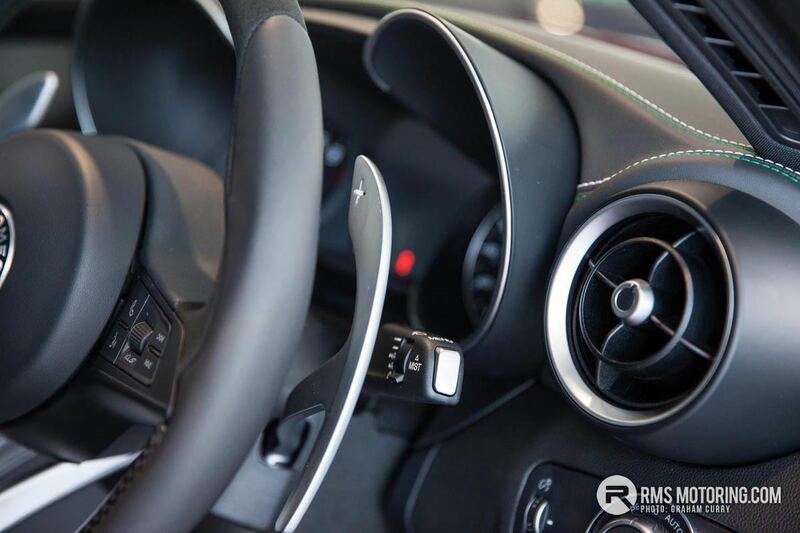 The three spoke steering wheel is just the right size and the aluminum paddles are integrated neatly and no more than a stretch of a finger away. 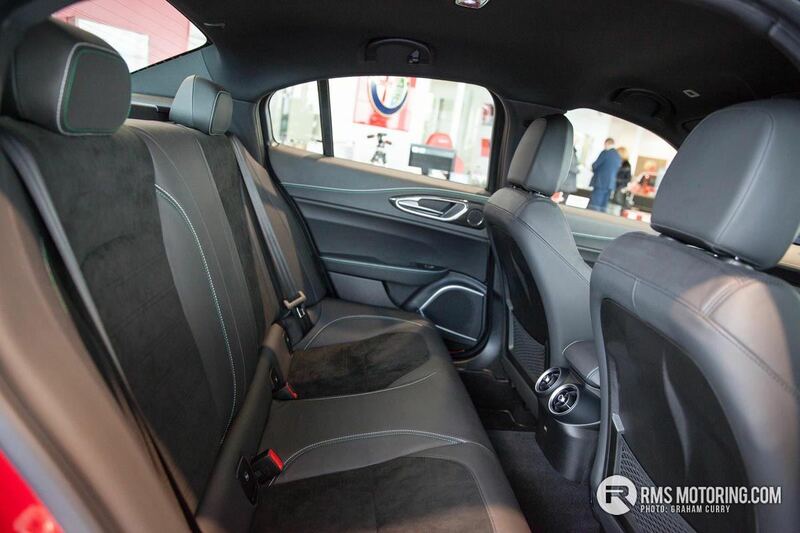 Pricing for Alfa Romeo’s advanced new super saloon will start at £59,000 on the road. 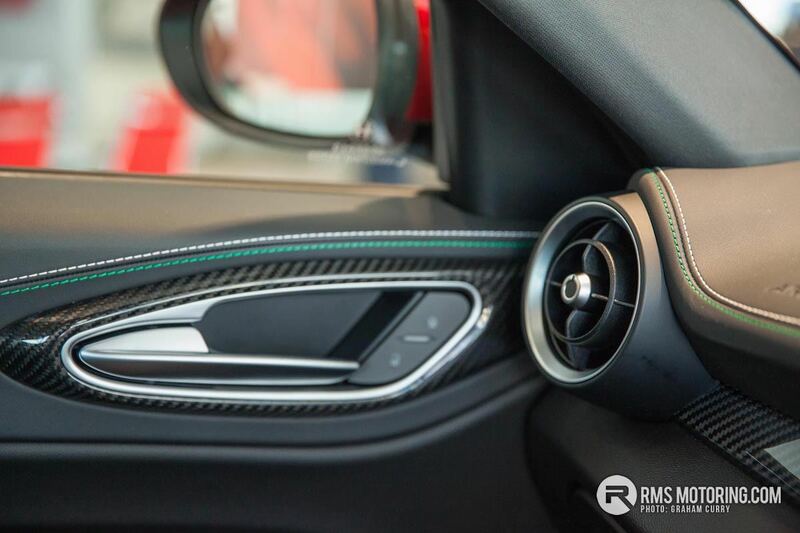 Deeper pockets will be needed if you fancy some carbon ceramic brakes and front seats “with a carbon fibre structural frame”. 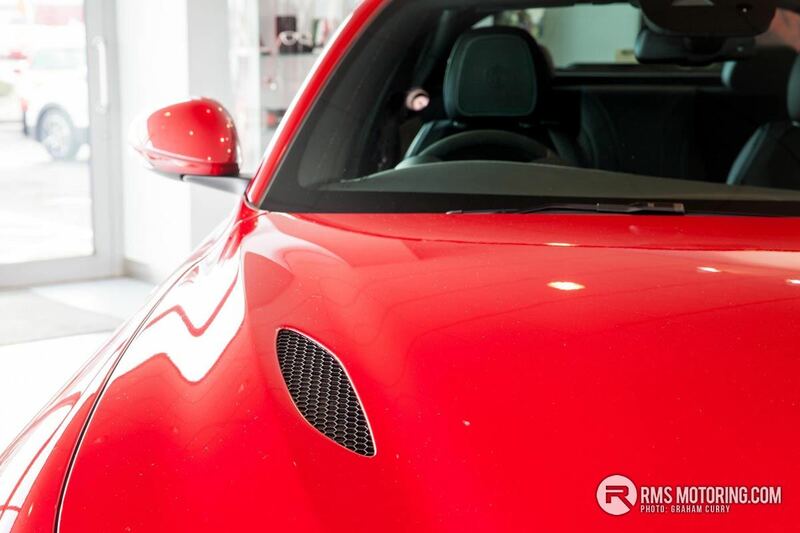 As always, RMS Motoring will bring you a full road test as Graham Curry has managed to secure one. Keep your eyes peeled for that feature. 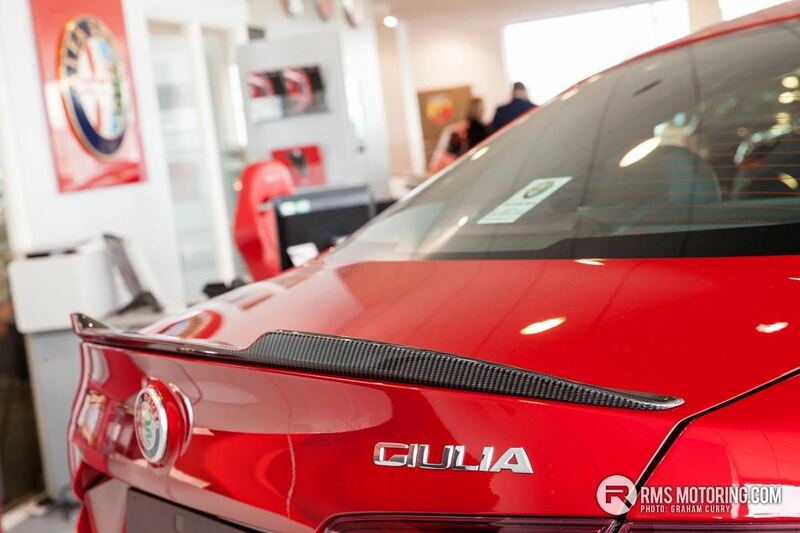 Meanwhile, check out the gallery from the model launch at Donnelly Alfa Romeo, Mallusk. 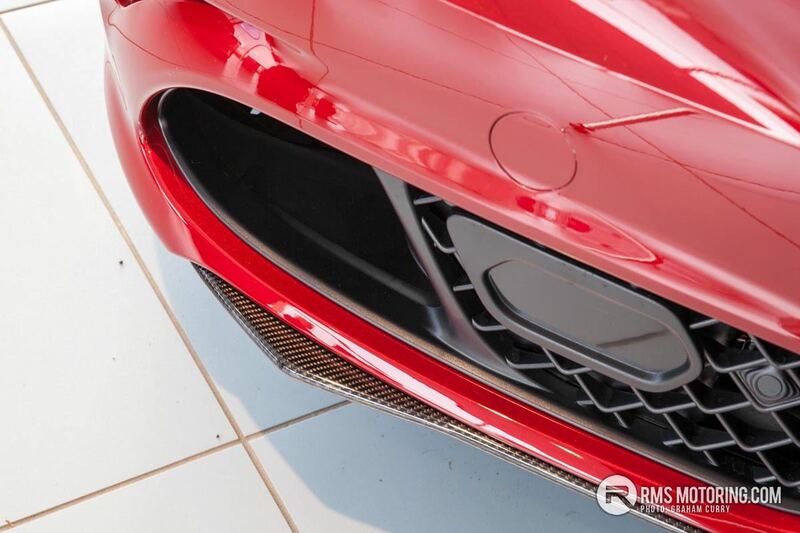 Whats the craic with the blank on the driverside lower grill? Badge area or is it some sort of gizmo? Where does the front number plate go? Wherever it goes it will ruin the front end. 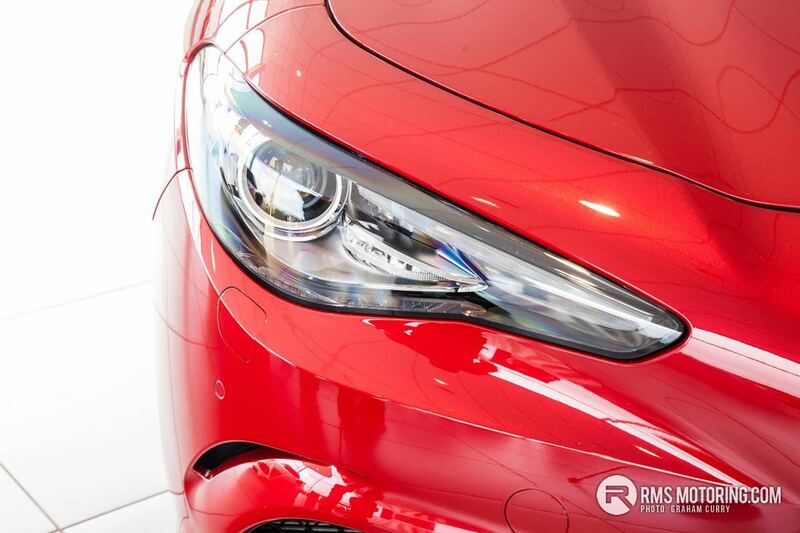 | Where does the front number plate go? Wherever it goes it will ruin the front end. 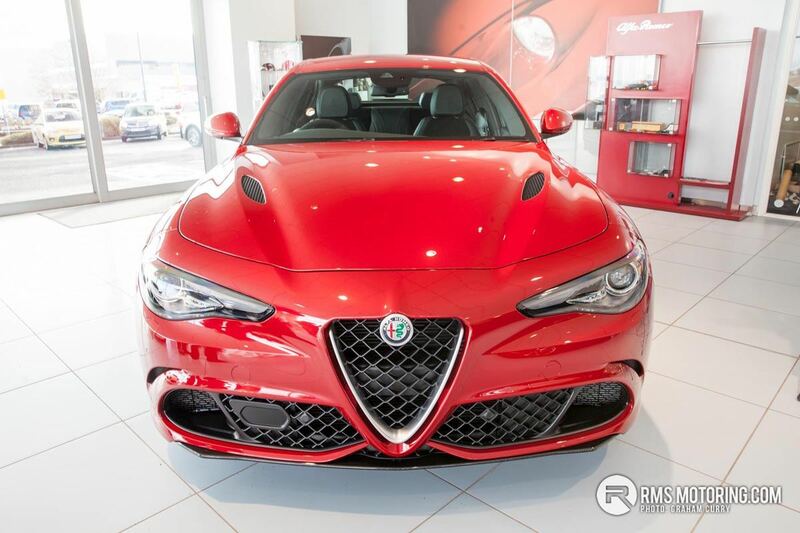 It looks better without a front plate, like all Alfas. 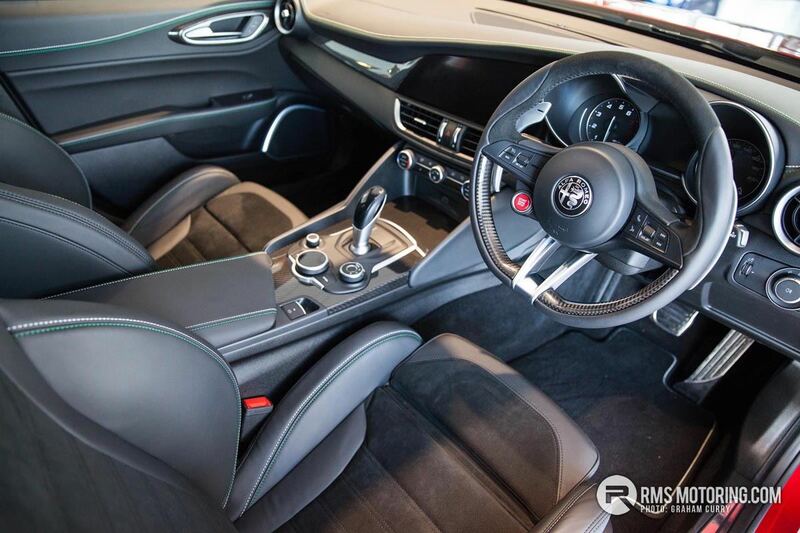 There's a quiet revolution happening at Alfa Romeo and this is just the latest instalment as they reposition the marque and significantly up the quality of the product.